Welcome to the world of programming. If you are looking for programming assignment help you have come to the right place. Our programmers provide quality assignment help to meet your deadline. 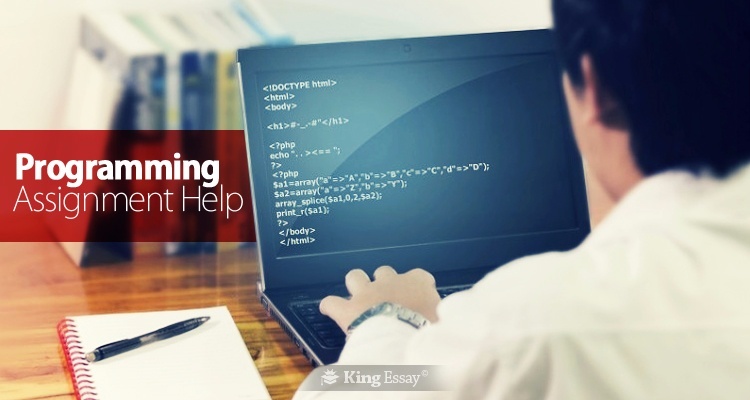 Whether your assignment is based on C, C++, C#, Java, SQL or any other language, King Essay has skilled programmers dedicated for each language. The main cause for concern for pupils in this field is perception. Understanding the theoretical concepts behind the coding may be easy. Applying those theoretical concepts thoroughly to a programming language is where the difficulty arises. Practice is the only thing which will help to generate fluency in any given language. A section of programming is only as good as the results it provides at the time of compilation. If that portion of code is incapable of providing the desired results, it must be rewritten. For learners this means learning new and diverse coding techniques to ensure compilation. To put it simply, it will take more time and you may or may not be able to meet your deadline. King Essay administers all-inclusive programming help with a money-back guarantee to meet your deadline with a program which compiles and produces results. Consistent Naming Scheme for Variables: This is the portion where all the variables are defined. The key to successful code here is consistency. Indentation: Indentation styles are not always distinct initially. As the program progresses the indentation method should become evidently understandable. Code grouping: Writing separate blocks of code for each procedure is ideal. Commenting: This practice will help to make the complete assignment understandable. It should be noted that obvious comments need to be avoided. Procedural VS Object Oriented: In some cases, object oriented programming might be effective while others will require the traditional procedural approach. The solution lies in creating a mix of both techniques. These are just some of the techniques used by our programmers. An effective law assignment is only valid under certain circumstances. Similarly, no programmer can ever implement all of these recommendations 100% of the time. The programming assistance presented to you by our experts will include round the clock customer support. If you want to add something to your project or you want to change anything you can do so at any time. We offer special promotions and discounts all through the course of the year. The final assignment delivered by our experts will be executable. We have carried out the necessary testing on the code to make sure that there are no programming errors in the final version. A productive math assignment should be able to give you the right answer in the end no matter what method you use. Similarly, the final programming assignment purveyed to you will help establish your position in your class.